NOTICE: Activation key must be used on a valid Steam account. Requires internet connection. About the gameFight as a soldier. Lead as a general. Rise as a legend.“Ryse: Son of Rome” tells the story of Marius Titus, a young Roman soldier who witnesses the murder of his family at the hands of barbarian bandits, then travels with the Roman army to Britannia to seek revenge. Quickly rising th… rough the ranks, Marius must become a leader of men and defender of the Empire on his quest to exact vengeance – a destiny he soon discovers can only be fulfilled much closer to home...Journey to the heart of the Roman Empire and experience the brutality of battle like never before as Ryse: Son of Rome comes to PC with support for glorious 4K resolution. 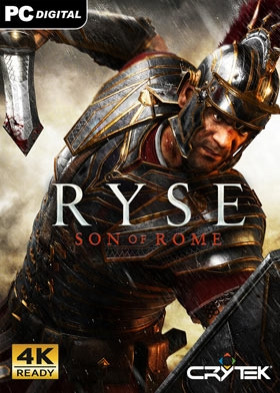 Continuing Crytek's legacy for groundbreaking games, Ryse pushes PC hardware to its limits whilst drawing players deep into the bloody drama of ancient Rome.“Ryse: Son of Rome” is an immersive action-adventure story of struggle, brutality and heroism. It follows a fearless Roman soldier named Marius Titus who joins the army to avenge the slaying of his family and emerges as a hero who must fight to save the Roman Empire.“Ryse: Son of Rome” presents a cinematic re-creation of the Roman Empire, its people, conflicts and landscapes in breathtaking detail and brings the brutality and intensity of Roman warfare to life in visceral detail. Key FeaturesThe complete Ryse experienceThe PC version of “Ryse: Son of Rome” offers the full experience, bundling the original Xbox One launch hit with all 4 DLC Packs. Next-generation cinematic immersionMarius’ tale of revenge comes to life through new advancements in performance capture, allowing players to interact with believably realistic characters. Brutally intense combat“Ryse: Son of Rome” delivers a visceral, brutally realistic combat experience with epic-scale battles. Relive the ruthless history of ancient Rome as you engage in raw, close-quarters combat against the barbarian hordes.Cooperative gladiatorial combat in the ColosseumColosseum Mode plunges you into the Arena to fight alongside a friend against an ever-changing array of enemies and challenges, to the roar of thousands of spectators. A dynamic battlefield Colosseum Mode includes 25 multiplayer maps, with tile sets ranging from British camps to Roman villas and Egyptian deserts. Forge your own LegendYou decide your destiny, customizing your gladiator through gold and Valor (XP) with new armor, weapons, shields, and consumables to win the crowd and survive in the arena. Taking full advantage of the PC4K gaming is another leap in graphics quality for PC gamers and Ryse is the perfect showcase for what’s now possible in high-end PC games. “Ryse: Son of Rome” leverages the power of Crytek’s CRYENGINE and the latest high-end PC gaming technology to present conflict in the Roman Empire like you’ve never seen it before. BONUS CONTENTRyse: Son of Rome for PC will come with bonus material originally released as downloadable content, including: The Colosseum Pack containing two character skins and two Arena maps. The Mars’ Chosen Pack containing one new character skin, four Arena maps, and the new Survival mode. The Duel of Fates Pack containing two character skins, two Arena maps, and one additional Survival map. The Morituri Pack, with three new Arena maps, two Survival maps, and five solo Arena maps. System Requirements Windows - Minimum CPU: Intel Core i3 2.8 GHz (3220T) - AMD Phenom II X4 3.2 GHz (945) CPU Details: SSE1-3, 4+ logical processors Memory: 4 GB RAM GPU: DirectX 11 graphics card with 1 GB video RAM - NVIDIA GeForce GTX 560 - AMD Radeon HD 7770 OS: 64 bit Windows (Vista, 7, 8) Hard Drive: 26 GB Windows - Recommended CPU: Intel Core i5 3.3 GHz (2500k) - AMD FX-6350 3.9 GHz CPU Details: SSE1-3, 6+ logical processors Memory: 8 GB RAM GPU: DirectX 11 graphics card with 2 GB video RAM - NVIDIA GeForce GTX 660Ti - AMD Radeon 260x or 7850 OS: 64 bit Windows (Vista, 7, 8) Hard Drive: 26 GB © 2014 Crytek GmbH, co-published by Crytek GmbH and Deep Silver (a Division of Koch Media GmbH, Austria). All rights reserved. CRYENGINE, Crytek, Ryse and all related logos are registered trademarks or trademarks of the Crytek group of companies in the EU, US and/or other territories. All other trademarks, logos and copyrights are the property of their respective owners.